This article is about the locality in Bangalore. For other uses, see Banashankari (disambiguation). 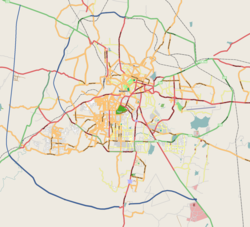 Banashankari (Kannada: ಬನಶಂಕರಿ), abbreviated as BSK, is a suburb near South Bangalore. It gets its name from the Banashankari Amma Temple on Kanakapura Road, one of Bangalore's oldest and well known temples constructed by Subramanya Shetty in 1915. Banashankari is the largest locality in Bangalore, extending all the way from Mysore Road to Kanakapura Road. It is bound by Girinagar and Rajarajeshwari Nagar in the west, Basavangudi in the north, Jayanagar and J.P. Nagar in the east, and Padmanabhanagar, Kumaraswamy Layout, ISRO Layout, Vasanthapura and Uttarahalli in the south. Banashankari is the only locality which has all the possible classifications – stage, phase and block. It is divided into 6 stages, with the 6th stage being the largest. This area is one of the oldest areas of Bangalore. It subsumes areas such as Hanumanthanagar, Byatarayanapura, Srinagar, Nagendra Block, Kalidasa Layout, Raghavendra Block, Brindavan Nagar, Srinivasa Nagar, Vidyapeetha, SBM colony and Ashok Nagar. This part of Banashankari is well-known for the Ramanjaneya Temple and Kumara Swamy Devasthana. PES Degree College is also located here. This area is close to Jayanagar. It is home to eminent persons such as Devegowda, Anil Kumble, P. C. Mohan and Ramesh Arvind. It has two well-known hills - Banagiri, which houses the Varasiddhi Vinayaka Temple and Devagiri, which houses the Venkateshwara Temple. It is the main commercial area of Banashankari. It also subsumes areas like Kadirenahalli, Teachers Colony II Stage, Yarab Nagar, Karesandra and Kaveri Nagar. Teachers Colony - This locality, developed mainly for school teachers, is a very well-developed locality and has the famous Narasimha Temple. Kadirenahalli Cross, which is a big junction adjoins Teachers Colony. Yarab Nagar is a Muslim majority area. At Yarabnagar, there is a mosque by name Masjid-E-Quba with minaret height measuring about 120 feet. Kadirenahalli was notorious for its long-delayed underpass which had hampered traffic in South Bangalore. The work started in 2008 and is now complete. A relatively new area, formed in the mid-1980s. It is divided into 3 phases and 9 blocks. It also subsumes areas like Muneshwara Block, Avalahalli, Srividya Nagar, Hosakerehalli, Veerabhadra Nagar, Kathriguppe, Bhuvaneshwari Nagar (Chikkalasandra), Kamakya layout, kathriguppe, janatha Bazar,Ittamadu, and Channammanakere Achukattu. An old village which was formerly under Rajarajeshwarinagar CMC. It is named after a famous lake in the vicinity. The NICE road passes through this area. Institutions like Little Flower Public School & PES University are located here. The lake has dried up and the land has been used up for constructions of houses. The commercial area of BSK 3rd/4th Stage. Kathriguppe is famous for being the locality where Sandalwood Stars of Cinema of Karnataka Upendra, Srujan Lokesh and Yash resides, Famous for Big Bazaar,health & glow, Poorvika mobiles , which was the first in South Bangalore. The development of the Outer Ring Road acted as a catalyst to the development of this village. Now this area has many factory outlets selling clothes at cheaper prices compared to other places in the city. Formed in the late 90's. It is further divided into 2 blocks. Whereas, 2nd block is a bit bigger and adjoins Uttarahalli, Marasandra, Doddakalasandra, Poornaprajna HBCS Layout, Bharat HBCS Layout and Vaddarapalya more towards NICE Ring Road. Formed in the mid 2000 and still in nascent stage in terms of development, this is the largest of all the BDA developed layouts, so far. It is further divided into 15 blocks. This is a sprawling locality nestling between Kanakapura Road in the East, Dr.Vishnuvardhan Road in the North, NICE Road in the West and South. The famous Thurahalli hill and reserved forest around is in the heart of Banashankari 6th Stage. This is a very scenic, serene layout with lot of greenery and rolling hills around. The area is well connected by the Bangalore Metropolitan Transport Corporation. There is also Volvo bus facility to this area. The area has a reconstructed bus stand and a Traffic Transit Management Centre. ^ "BDA Approved Layouts". Bdabangalore.org. Retrieved 15 November 2013. ^ "BDA Layout South Division". Bdabangalore.org. Retrieved 15 November 2013. Wikimedia Commons has media related to Banashankari. This page was last edited on 12 April 2019, at 09:42 (UTC).